I have to tell you, I am having an absolute blast with April in the Raw. If you’ve missed any of the posts so far, be sure to check out Brittany’s fabulous week one recap. I’ve been busy doing an awful lot of “uncooking” in my kitchen. 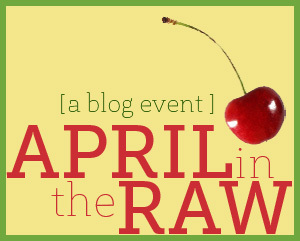 I’ve decided to focus most of my blog posts this month on raw recipes, even though I only have one official day on the April in the Raw schedule. So far, I’ve done raw cinnamon toast. I’m working on a raw breakfast banana split for Hallie’s Build a Better Breakfast challenge. I’m working on some raw fudgy bars for Linda’s Create a Gluten-Free dessert bar challenge. I’m scheming about how to make a raw cake pop for the Raw Cake Pop challenge. And, I’m thinking awful hard about how to do something raw with asparagus for Ricki and Kim’s Sweet or Savory challenge. But, you’re just going to have to wait on most of that. I know. Waiting is torture. To make it up to you, how about you get two recipes today? Both raw, both nut-free, both packed with good stuff. And, if they just so happen to go well together, well, all the better. Yes, yes, those crackers are green. And guess what, the kiddo ate them. And the spready cheeze. Oh yes he did. Put all ingredients in a food processor and process until smooth, scraping the bowl occasionally. Add more water if a thinner consistency is desired. Process all ingredients except sesame seeds in a food processor until smooth. Spread on a teflex dehydrator sheet (or fruit leather tray). Sprinkle with sesame seeds. Dehydrate at 140° for one hour. Score the crackers with a pizza cutter. Turn down heat to 115° and continue drying. Check them occasionally and when they are dry enough to remove from the teflex sheet, remove them and continue drying until crispy. Mine dried for about 20 hours. Looking for more sugar-free foods? Check out Sugar Free Sunday. Want more slightly indulgent fare? Check out Slightly Indulgent Tuesdays. 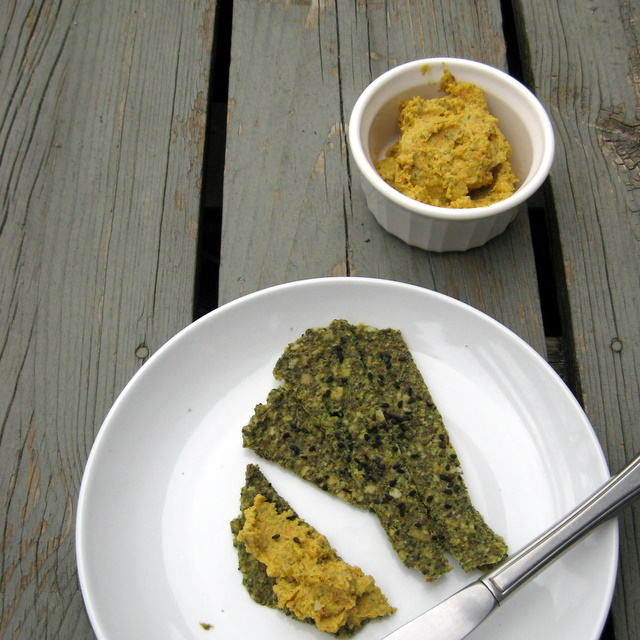 This entry was posted in carrots, flax seed, grain-free, nightshade-free, nut-free, raw, sesame, side dish, snacks, sunflower seeds, vegan and tagged crackers, dip, grain-free, nut-free, raw, recipes, snacks, vegan. Bookmark the permalink. Ooohhh- I love this version of cheese and crackers. And I love that you “hid” vegetables in it- like the carrots in the cheese. I would have never thought of that! More of a push for me to get a dehydrator! And, reading all that you are working on, I realize I’m a bit behind myself. And I didn’t know about the Raw Cake Pop event … hmmm. Anyway, I bet these crackers and spread are fab, Deanna! Thanks Shirley! I’m still not entirely convinced that dehydrators are all they are cracked up to be – it’s a long, long time to run an appliance for a relatively short payload. But, when I plan well, I can fill the thing with stuff when I run it. Sadly, I don’t plan as well as I could…..
Oh Deanna! This is awesome. Can I just tell you I feel SO LUCKY to have a group of blogger friends that put so much thought into incredible recipes like this?? Love , love, love your take on cheese and crackers- AND that you manages to make a Cheese without nuts. Thanks so much Brittany. I really am having a blast with this raw food stuff. And perfect timing, too – it’s supposed to be in the 80’s here today, which just makes me want to eat fresh, vibrant living foods! This is for ME! I’m nut, dairy, soy, gluten-free. so I’m all about this cheese!! I’m making it, so thank you so much for sharing this cheese-tastic recipe with us!! Deanna, Wow! You’ve got some incredible recipes coming out of your kitchen. Just love this new idea for a seed spread. Hope you are well! Love that Cheezy Spread! Looks so easy. I need to pick up a few things to make those crackers– I definitely want to make them! Raw cheese and crackers! Fantastic!!! I tried my hand at flaxseed crackers last week. Can’t wait to try these, Deanna! Thanks so much Heather. Please let me know how they work out for you! Wow! These sound lovely. I love the hidden carrot and zucchini. And crackers and un-cheese… Yum! Love the recipes coming out of this event. Thank you Sea. Hidden veggies are always a good thing, no? You know you already impressed me with your cinnamon toasts so I look forward to giving your crackers a try soon. P.S. I can’t wait to see the raw cake pops!!! I have to get on that cake pop recipe. I think I have a good idea….